On 19th June local SMEs met with members of the SETsquared Scale-Up programme. The inititive which launched earlier this year will unite innovative SMEs with academics enabling them to grow their research and gain strong impact with the support of a partner institution, such as the University of Exeter. 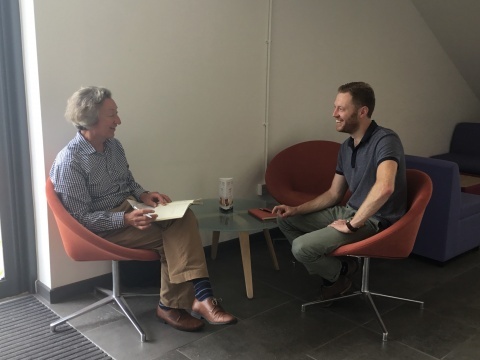 SETsquared clients, SeeDATA based at Exeter Science Park met with Andy Burroughs, Healthcare and Wellbeing Sector Lead. Guests also included Nick Leaney from Aardvark Environmental, Murray Reed, Innovation Manager, Sam Mickleburgh, Expert in Residence and Robert Kathro from the Environmental Futures and Big Data Impact Lab. The Scale-Up Programme has been developed following a £5m award from HEFCE that will support the most innovative scale-up companies across the South of England. Designed for companies with 10 or more employees, the scheme is focused on digital innovation, advanced engineering & manufacturing, health & wellbeing and environmental, sustainable & maritime/marine. The programme will help scaleups to secure funded R&D projects with the SETsquared universities, make introductions to investors, corporates, customers and partners and access talent. They will also be able to access peer-to-peer learning and review of business and growth management.